The first few years of life are extremely important to the future growth and development of your child. You, as parents, are most responsible for guiding your child through these years. These are wonderful times to laugh, play, and learn from and with your child. By learning what your child will be doing at different stages, you will become a better informed parent, able to take pleasure in your child's growth, yet alert to any possible problems in development. Trust your instincts and feelings as you watch your child grow. Don't ever be afraid to ask questions. Your doctor can answer any questions you may have about your child's growth, and WV Birth to Three is available if you have concerns about your child's development. Easter Seals creates solutions that change lives of children and adults with disabilities or other special needs and their families. The WVU Genetics and Counseling Center provides genetic services to the people of West Virginia and surrounding areas and acts as a resource agency for health professionals. 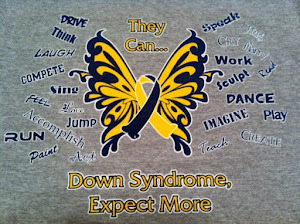 The mission of the DSNWV is to enhance the lives of individuals with Down Syndrome by providing information, resources and support to families and professionals and by promoting awareness and acceptance of individuals with Down Syndrome. Kanawha, Clay, Boone & Putnam Co.